2014 AMA Hillclimb Grand Championship Results! This past weekend, Valley Springs M/C hosted the 2014 AMA Hillclimb Grand Championship in Bay City, WI – and it was an *epic* event! To start off, here’s a few facts about the event…the official count of actual entries that competed on race day was 496 – we actually had 510 entries mailed in, but as can happen in racing some riders had to cancel their plans due to broken bikes, injuries, etc. At the last Grand Championship VSMC hosted, there was 522 entries. Still, this was only the 2nd time in AMA history that over 500 entries had been received for a national championship hillclimb, and the 496 race-day number still solidly places this event as the #2 overall in terms of entries – 3rd place in that list is the 2010 event at Oregonia, OH hosted by Dayton M/C, with 466 entries. …yeah, the hill was kinda steep. In terms of actual riders themselves – a headcount, if you will – there were 217 riders competing this past weekend, hailing from 15 different states across the country from New England to Nebraska. Which is one more than the 216 we had at the 2012 event. Unfortunately, this is not normally a stat that is tracked by clubs hosting the championship, so I can’t guarantee this…but it seems all but certain based on the entry numbers that the 217 riders we had this weekend was an all-time record*. On behalf of Valley Springs M/C, we are incredibly grateful for the immense outpouring of support for our event (again), and proud of and humbled by the rider and entry counts. As with any national championship race, it’s the riders that make the event – not the club…and wow, did you guys make an event! Record amounts of riders and entries make it all worthwhile! *Now that I think about it, back in the day you could only ride one class at nationals…and they’d allow up to 400 entries, which would mean up to 400 actual riders. If anyone has any access to information about how many riders showed up at nationals during the 1-class days, let me know. **OK, I stand corrected…an old friend who goes by “Woodsrat” searched through his archives and found that back in ’84 they had 301 riders at Prestonsburg, KY – which meant 301 entries. After which the rider counts started dropping, eventually getting under 200 (which meant under 200 entries too)…and then the rule was changed allowing riders to enter multiple classes at nationals. So no…our 217 riders is by no means an all-time record – but it might be so since the rule change. 9-year-old Bodee O’Neil tallied up a second national championship in the Mini Jr. class with a 15.776 second ride on his Suzuki, and once again it was Casey Paider hot on his heels in 2nd with a 17.131 second ride on his KTM. In third place was Damion Huppert and his KTM, also of Ellsworth, WI, with a 20.628 second ride that made proud poppa Brent jump up and down and holler so much at the base of the hill that we thought we might need to get him some oxygen! And I’m here to tell ya, folks, there’s nothing better in this world than watching the reactions from mom & dad when their kids do well at an event like this – everyone in the crowd was hootin’ & hollerin’ right along with Brent 😉 Only 2 other riders in the Mini Jr. class made it to the light – Brodie Bennett of Gays, IL got his Kawasaki to the timer in 21.220 seconds for 4th place, and Kyle Oaks from Caledonia, MI made it there in 24.274 seconds on his Honda to round out the top 5. Ellsworth, WI’s Luke Cipala started off what turned out to be a stellar day for the Cipala family on Sunday with a win in the Mini Sr. class, riding his Suzuki through the top timer at 17.536 seconds. Landon Gilbertson, also from Ellsworth, posted an excellent 18.823 second ride on his KTM to take 2nd, and Honda-mounted Braiden Henry of Mankato, MN took the last podium spot with a 19.809 second ride. The only other Mini Sr. rider to make it to the top was Brock Riffe, from Ashland, KY, who got his Honda there by sheer force of will…despite several bounces off-course from rocks, bumps, and ruts in the challenging hill that probably would have ended most riders’ attempts, Brock kept righting the ship, working the clutch and twisting the throttle, and made it to the lights in 25.247 seconds. Julia Buettner made the trip from West Bend, WI, and took home the #1 trophy in the Mini Girls class with a 435′ ride on Saturday on her Kawasaki. Former Mini Girls national champion Olivia Bach, from right here in Bay City, WI, picked up the 2nd place trophy this year with a 411′ foot effort on her KTM on Sunday. And Reagan Riffe of Ashland, KY, the only other rider to make it past the 300′ mark, took 3rd with a 358′ Saturday ride on her Yamaha. Valley Springs M/C elected to offer a Super Mini class for the first time…believe it or not, up until now super mini bikes (like the Honda CRF150, Kawasaki KX100, and KTM 105) have not been legal to use in *any* hillclimb class – so to invite those machines into the sport, VSMC decided to give this class a try. Only 2 riders took the challenge, with Andrew Fortner of Pittsboro, IN taking the win on his Honda with a 481′ ride over Sami Oaks, from Caledonia, MI and her Yamaha, who posted a 202′ ride on Sunday. The 125 class saw the 2nd win of the day for Luke Cipala, as he hit each jump straight and true and kept his KTM on the pipe to get a 13.066 second time. Taylor O’Neil, from Hager City, WI, was close behind on his Yamaha and took 2nd with a 13.851 second time on Sunday. The 3rd place trophy was claimed by Levi Peters, of Neoga, IL, who got his Yamaha to the top in 14.202 seconds. In the category of “almost had it,” Nathan Prebe of Frontenac, MN kept his Honda wicked and came up just 31 thousandths of a second short of a podium spot, taking 4th place with a 14.233 second ride. 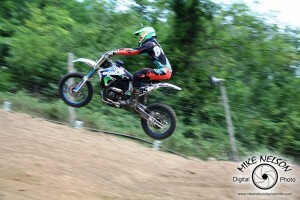 Brock Riffe and Andrew Fortner were the only other 125 class riders to come in under 15 seconds. Not content to let Bodee have all the fun, Taylor O’Neil took home the gold in the 200 class on his KTM with the only 11-second ride in the class, posting an 11.952 second time on Sunday, after having made it only 492′ on Saturday. Jason Laven, from North Mankato, MN, was only a couple clicks shy of the win, putting his KTM through the lights with a 12.160 second ride on Sunday. And for the second class in a row, Levi Peters took home a 3rd place trophy with a 12.840 second effort on his Kawasaki. No other rider in the 200 class got into the 12s, but Brock Riffe and Stolling, WV’s Joseph Lowe posted the only 13-second rides in the class, with a 13.620 and 13.707 respectively. The 250 class turned out to be the start of an incredible day for Ellsworth, WI’s Logan Cipala. After seeing little brother Luke card 2 class wins, Logan went to work with the only sub-11 second ride in the 250 class, sailing his Kawasaki through the top timers at 10.955 seconds…a nearly unbelievable ride to steal the win from Logan Peterson of River Falls, WI, who up until then seemed to have the class locked up with an 11.016 second ride on his Yamaha. Peterson’s ride on Sunday seemed perfect – every jump hit just right, every rut tracked straight…and then Cipala did what Cipalas do, and somehow came up with a ride that was more perfect than perfect. Remember though…this was just the start of Logan Cipala’s day… Nathan Prebe of Frontenac, MN, came in about a tenth of a second behind Peterson for 3rd place, posting an 11.130 second ride on his Honda – in turn, just tenths of a second in front of Jason Braun (11.144 seconds – Sleepy Eye, MN) and Joel Falde (11.281 seconds – Ellsworth, WI). A similar story played out in the 450 class on Sunday – Logan Cipala was winning the class after the first round with a 10.659 second ride, only to see Logan Peterson move into the lead with a 10.420 second ride. Once again though, Cipala reached deep down and blasted through the lights with a nearly nine-second ride, coming in at 10.018 seconds to take his 2nd class win of the day. Troy, KS’s Eric Donaldson came in closely behind Peterson on his Honda with a 10.468 second ride. 3 other riders in the class made it into the 10-second bracket – Jared Gitter (10.723 – Dodge Center, MN), Nathan Prebe (10.775 seconds) and Zach Degross (10.962 – Ellsworth, WI). 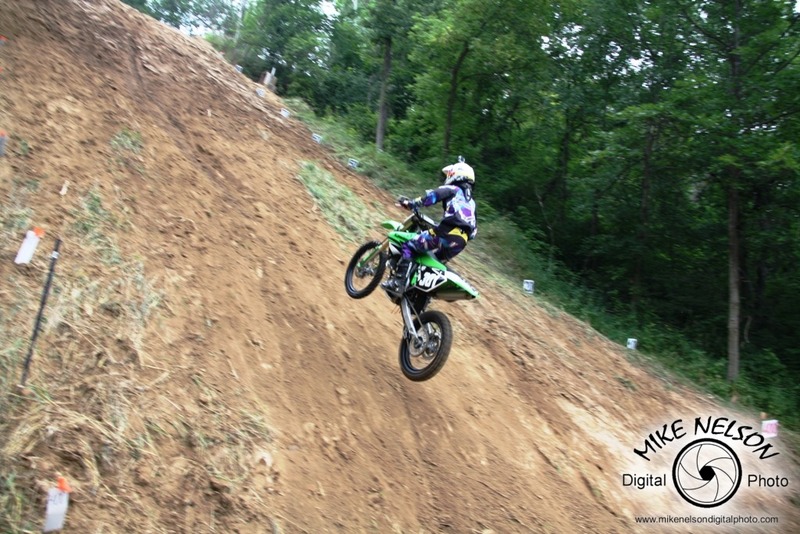 Continuing on with the Logan Cipala riding clinic, his 2nd ride on Sunday in the 600 class broke the previous hill record…at the 2012 Grand Championship, Kirk Mueller of La Valle, WI had sailed his Open class Suzuki through the lights at a blistering 9.465 second time. On Sunday though, Cipala rocketed out of the hole, cleanly doubled the first 2 jumps, kept the machine close to the ground over the technical 3rd jump, and threaded one of the needles on the last jump (which was riddled with ruts) and burst through the lights on his howling Kawasaki in 9.348 seconds. Eric Donaldson could only shake his head in disbelief, having been relegated to 2nd place on his Honda after having posted an excellent 9.863 second ride, and ditto for the former hill record holder, as Kirk Mueller himself came in third on his Honda with the only other ride under ten seconds at 9.908. The 750 class saw some stellar rides, and would have qualified 3 riders into the King of the Hill class, if it wasn’t for the fact that Johnny Curry III was even faster on his 600 class bike. Curry took the class win for Alkol, WV on his Suzuki with a flawless 10.098 second ride on Sunday. Ben Gingery of Wathena, KS, on the only other Suzuki in the class, came in a couple clicks short of the win with a 10.271 second ride, and Travis Schroedl from Fairfax, MN, posted the only other 10-second time to take third place with a 10.550 second ride in the second round, on the only KTM in the class. Former hill record holder Kirk Mueller came in fourth on his Kawasaki at 11.034 seconds. The Open class was mind-blowing. The first-round riding was great, with Logan Cipala holding the lead at the end of Saturday with a 9.715 second ride on his Buell. On Sunday though, a succession of riders kept pushing Logan farther down the charts, starting with Arnie Jelinek of Hawley, MN, who first took the lead from Cipala with a 9.639 second ride on his Honda. That wouldn’t hold up either though, as a few rides later Kirk Mueller blew through the timers on his Suzuki with a 9.576 second ride…in turn to be bested shortly thereafter by Jared Gitter on his Suzuki, who posted a 9.560 second time. Then, exactly one ride later, Eric Donaldson leveled the competition with a 9.404 second ride on his Honda…and it looked like that time might stand. But then Nick Bronnenberg, of Perry, IA, stepped to the plate with his Suzuki and did what no one had ever seen done before – he laid down a scathing run, pinning the throttle on the GSX-R, which shrieked with unbridled fury as he tripped the top timer at 9.348 seconds! Think about that number for a moment…you’ve seen that number before. Bronnenberg had just *tied* Logan Cipala’s new hill record, set a short while before in the 600 class. The crowd went absolutely nuts…never before had anyone ever seen a tie for the fastest time of the day…let alone for the hill record. Like I said…mind-blowing. But wait…there’s more. We weren’t done with Open Class drama. You see, through all of those stupendous rides, from the most talented riders and the best bikes in the sport, Logan Cipala was sitting in line in the staging area. Watching. Waiting. And what he had to show us, no one would have believed if they hadn’t seen it with their own eyes. Cipala calmly rolled his Buell to the line, thumbed the giant EBR twin to life, and stared the hill down. This monstrous, treacherous, NASTY hill. It was Cipala vs. hill. And the hill blinked. Cipala put the throttle to the stop, launching the Buell with a force never before seen, and he kept it pinned all the way through the first jump…and that second jump, that the *really* fast guys all day were bouncing their rear tires off of? He cleared it. But he didn’t just “clear” it. The roaring Buell soared over that jump, and didn’t hit the ground again for another 20 feet. Cipala remained at full throttle, until at the exactly right moment he backed off and shot the machine over the 3rd jump, perfectly keeping it close to the ground so as to not lose time in the air, and then was back on the ground and balls-to-the-wall, never again rolling the thottle back even a hair. He threaded the last jump without issue and obliterated the super-loose and super-steep top section of the hill that had defeated so many before him…and when the dust cleared, the mesmerized crowd turned their eyes to scoreboard to see the impossible. It read 8.511 seconds. Eight tenths of a second faster than Bronnenberg, and the hill record he had momentarily shared with him…and nearly a full second faster than the previous hill record. Un. Believe. Able. And yet there it was. Logan Cipala had completely destroyed everyone’s preconceptions about what would be possible that day. In the Senior class, Wade Schultz from Lisbon, IA took the class win on his Suzuki with an incredible 9.662 second ride, with multi-time national champion Mike Wood from Bay City, WI taking second on his Honda with a 9.965 second time. Todd Cipala, not content to let the kids have all the fun, and who is also a multi-time national champion, rode his Buell to third with a 10.927 second time. The Super Senior class belonged to Woodbury, MN’s Tim Cain, who posted an 11.798 second ride on Saturday to take the win. Brian Kinney, of Wausau, WI, took second with an 11.905 second ride on his Honda, and Les Wolfe from Fleming, OH, rounded out the top three with a 12.283 second ride. No other riders in the class made it under 13 seconds. Hometown rider Casey Wood, from Bay City, WI, claimed the win in the Womens’ class on her Honda with a 13.520 second ride, taking the lead away from Nicole Bach, also of Bay City, WI, and her KTM who was in charge with a 14.519 second time. 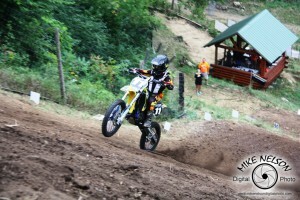 Amber Frye, from St. Albans, WV, rode her Honda to third in the class with a 15.870 second time on Sunday. No other riders in the class made it under 16 seconds, and only the top ten out of the 21 riders made it to the top at all. …remember a few classes ago, when Logan Peterson lost twice in a row to Logan Cipala? Peterson would claim redemption in the 4-Stroke class, taking the class win with a 10.431 second time on Sunday on his Yamaha. Jared Gitter took 2nd with a 10.547 second ride in the first round with his Yamaha, and Nathan Prebe got third on his Honda with a 10.854 second time on Sunday – they were the only riders in the class to break into the 10-second bracket. Nathan’s brother Aaron, also from Frontenac, MN just barely missed the podium on his Honda with an 11.013 second time for the 4th place trophy, and Josh Denson from Neoga, IL rounded out the top 5 in the 51-rider class with an 11.350 second time on his Kawasaki. Johnny Curry III took home top honors in the 400 Stock class, with a 14.912 second time on his Yamaha. Brandon Urban, from Williamson, WV, claimed second with a 15.125 second time on his Honda, and Johnny Curry Jr., III’s dad, took third place with a 16.249 second time on his Yamaha. Logan Peterson laid claim to a second victory in the Open Stock class, with a winning 16.218 second time on his Suzuki. Lemar Hines, of Ellsworth, WI, took home the 2nd-place trophy with a 16.700 second ride on his Honda, and Joe McGurer from Brownsburg, IN got 3rd on his Honda with a 16.979 second ride. The ATV classes were lightly attended, with Josh Shafer of Caldwell, OH besting Mike Dosdall from Hager City, WI to take the ATV 450 class win on his Yamaha with a 15.092 second ride, besting Dosdall’s 16.300 second ride on his Yamaha. The ATV Open class went to Hager City, WI’s Austin Welch with a 12.299 second ride on his Yamaha, as he convincingly took the win over Brian Childs of Welch, MN on his Kawasaki and his 15.586 second time, and Mike Dosdall on his Yamaha at 16.084 seconds for 3rd. Dion Welch of Hager City, WI was the only rider in the ATV Senior class, and got the big trophy with a 469′ effort on his Kawasaki. And now for the “as close as it gets” part…VSMC elected to qualify the top ten riders from each lane into the one-run King of the Hill shootout at the end of Sunday’s program. Logan Cipala started the class off with a searing 9.491 second time on his Buell, but would not be able to hold the lead. Joel Falde turned a 9.486 second time on his big KTM twin, and Nick Bronnenberg came back swinging with his Open class Suzuki with a 9.274 second ride. But the man in charge seemed to be Eric Donaldson, who laid down a beautiful 9.072 second ride on his Open class Honda…and to many it looked like that would take the win. But all the way from Pisek, ND came Shawn Jelinek, who qualified into the KOTH from the Open class on his Kawasaki, and Jelinek wrung every last drop of horsepower from his machine as he smoked the hill in 9.071 seconds…taking the win away from Donaldson by one one-thousandth of a second…which is the limit of the precision of our timing system. Meaning that literally, by definition, it doesn’t get closer than that. Unsurprisingly, Logan Cipala received the AMA Amateur Hillclimber of the Year award at the trophy presentation. Logan is sponsored by LaVern’s Small Engine Repair, Lectron Fuel Systems, Mike Bronk, West Bend Harley-Davidson, FMC, Mika Metals, and Ti Lube. 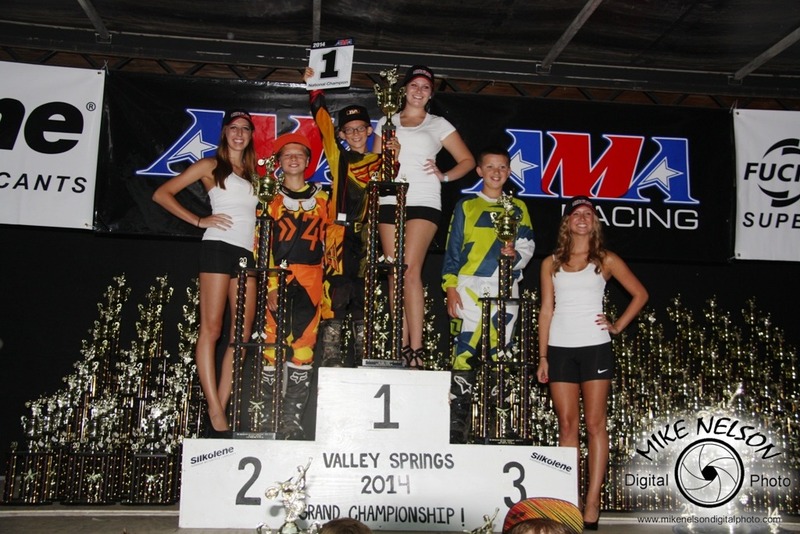 Big day for Logan Cipala…4 class wins, fast time of the day, AMA Amateur Rider of the Year, and attention from girls! Bodee O’Neil was awarded the AMA Youth Hillclimber of the Year honors for his efforts. Bodee is sponsored by Plummer Concrete, Feine Tune Motorsports, Broz Bar, and O’Neil 5 Star Trucking. Mini Jr. podium – Bodee O’Neil, Casey Paider, and Damion Huppert. As I close, I’d like to wish Molly Carbon a speedy recovery…she suffered the only confirmed injury of the weekend with a broken ankle*. All of us at VSMC wish Molly well and hope to see her again in the future. In 2012, Bertha Wright suffered a similar injury, and we were delighted to see her full-throttle attempts on the hill yet again this year. Thanks again to all the riders who made our event awesome! *Turns out it was just a really bad sprain…not a break. Which is great news! All photos courtesy of Mike Nelson Digital Photography – all rights reserved. No reproduction without prior authorization.